A rare Friday outing began with a speedy bus journey to Todmorden. Having no firm plans about what to do when we got there, Phil suggested going up to Cross Stone to re-examine a prehistoric site, previously visited during an archaeology trip some time ago. I agreed, with the proviso that we had food first. Alighting at the bus station, we entered the classic market hall to be tempted by an all-day breakfast at the cheap ‘n’ cheerful Market Hall Café. From the town centre, we took a back route eastward, stopping briefly in the community garden. Bees buzzed amidst colourful flower beds. Young green apples hung from low branches. Juvenile jackdaws searched for worms on the moist grass. A small tent pitched close to the bins, suggesting someone lived there. Proceeding down back streets we noted the familiar northern town grid-pattern terraces. We walked the length of the unmistakably Victorian-named Industrial Street, and turned right onto Anchor Street. At the corner of Halifax Road, I cut through the grounds of Roomfiled Baptist Church to re-join Phil on Halifax Road. We paused on the bridge over the River Calder to watch dippers hopping among the stones as small fish created concentric ripples on the water’s surface. The second turning on the left marked the start of our climb up Cross Stone Road. Urban landscapes quickly gave way to a more rural aspect. Steep curves led us past dark green verges, almost submerging large stones and unkempt benches. An old toll house had been converted into a twee cottage. At the top, we felt overheated layer and rested awhile by a clump of dog roses. We turned up Hey Head Lane toward the golf club. Unsure of where the earthworks lay, we followed the drive into the car park, and started heading upwards across the green to a likely ridge. Phil asked a helpful golfer if he knew where the site was and he directed us to the top of the course. On a further ridge, we tried to differentiate between ancient markings and modern bunkers. A second golfer shouted sarcastically “take your time!” before informing us about a public footpath along the top edge of the green. This turned out to be quite pleasant. Edged with small shrubs, grasses and willow herbs, we discovered what looked like a grave marked by a standing stone in a boggy patch. Quest over, we returned to the marked path. A gap in a lovely stone wall led back onto the lane. I developed indigestion as a result of eating just before embarking on the climb. I tried to ignore it and concentrated on the pleasant walk down. In places, hedgerows of hawthorns were fronted by stone walls suggesting that Medieval hedges had then been added to later. Back in the village, we rested on a wall by the now-defunct church. Ignoring the curtain-twitchers, we looked round for the stocks then realised they were by our feet, almost totally overgrown with weeds. We had noticed a footpath down the west side of the churchyard and guessed it might cut out the first big bend on Cross Stone Road. The extremely narrow path soon arrived at some steps. A woman gardening informed us of the way to go, but it seemed to be leading in the wrong direction. The untrodden path took on a spooky aspect, until we reached another ‘junction’. I suggested taking a lane back to the road rather than following the path (signed ‘Calderdale way link path’) as I didn’t want to end up walking along the tops all the way home. We past an impossibly cute row of houses, followed by a row of posh parked cars. Later, I discovered it was marked on the map as ‘Carr Lane Farm’, but the clues implied this was now a des res. Carr Lane became grassy as it led us down to Cross Stone Road. From there, it was an easy stroll down to the main road where we caught a bus straight away and were soon home. This entry was posted in archaelogy, heritage, landscape, photography, walking and tagged Anchor Street, apple tree, archaeology, barrow, bees, bog, bronze age, bus, Calder Valley, Calderdale, Calderdale Way, camping, Carr Lane, Carr Lane Farm, church, climb, community garden, cottage, Cross Stone, Cross Stone Road, crow, dog rose, earthwors, England, evidence, farm, farmhouse, field, field boundary, flowers, food, Friday, garden, golf club, Halifax Road, hedgerow, industrial heritgae, Industrial Street, jackdaw, landscape, market hall, Market Hall Cafe, mound, nature, path, photography, ridge, river, River Calder, shrubs, standing stones, stile, stocks, stone, stone walls, stones, Stoodley Pike, summer, Todmorden, Victorian, views, walk, walking on July 17, 2018 by Hepdene Rose. The last week in June brought a series of travails and despite the gorgeous sunny weather, life felt hard. On the Thursday afternoon, we thought that one of our favourite wood walks might cheer us up and cool us down. At the top of the cuckoo steps, I needed to catch my breath before crossing the road and taking the path into Eaves Wood. A felled tree obstructed us. Momentarily thwarted, we managed to navigate through the jumble of branches. As we climbed the ridge, the sun beat down. “It’s like being on holiday in the Med” I commented. Phil casually mentioned that he’d always said it was the hottest spot in Hebden – now he tells me! We noted that the views down into the valley were obscured by profuse growth. I needed to rest and drink water but the lack of shade and prolific bracken meant my usual spot was not an option. I slogged on until we reached the trees. After resting awhile on the path edge, we continued and I realised that if I’d waited a little longer I could have sat on the seat-like stone a short way up. At Hell Hole rocks we explored the disused quarry. Normally dank, twigs and leaves on the parched earth crunched beneath my sandals. Today deserted apart from crows high in the treetops, we had fun guessing the pastimes of recent visitors from the evidence they had left behind including a tent peg and sweet wrappers. Past the rocks, we decided to stay down in the woodland rather than climbing straight up to Heptonstall. Descending a flight of twee steps, we noted almost impossible greenery. Small dapples of sunlight and fern shadows fell artily on the stone treads. The landscape became like pixie land as the myriad paths from the Victorian job creation scheme led in all directions. Small birds flitted through trees and a squirrel scampered into the undergrowth. Finding it hard to choose the best route, we kept to the middle route until we reached a more significant-looking fork, thinking we would soon reach the top wall and thus the lane up to the village. However, we ended up in what we realised was the lower end of Slater Ings. The path became indiscernible in places. Large square boulders lay higgledy piggledy (most likely a result of quarry dumping). We had a tricky climb through huge ferns, stopping often to locate the best way through. Even so, Phil banged his head on a tree branch. Eventually, I spotted what I assumed was the top wall above us but could not see an obvious access point. Then Phil noticed that it was not the wall I’d thought it was. Nevertheless, we had to go upwards to reach civilisation. I saw a gap in the wall and clambered over large stones towards it. On reaching the top, we realised there had once been a proper path and crossing point – apparently eroded since our last trek through this neglected lower part of the wood. We came onto the lovely rocky path that we knew quite well at the top of Slater Ings, albeit not as far along as expected. But it was easy enough from there to reach the lane up to Heptonstall. On the corner of Green Lane, I noticed a styal into fields which I knew would cut a corner out. 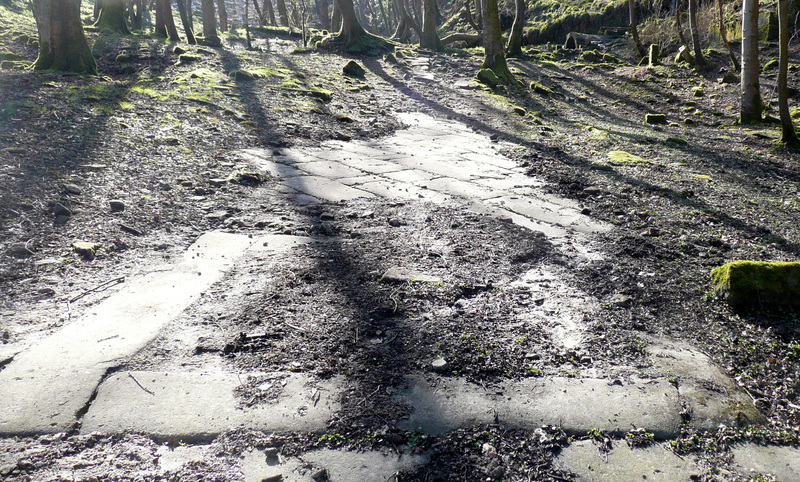 This turned out to be part of the Hebden Loopi. We crossed a beautiful meadow with attractive paving underfoot, heading for a picturesque treeline to emerge onto the road. In the village, we entered The first pub for refreshments. At the bar, we exchanged a few words with an acquaintance, ordered pints, grabbed menus and headed for the beer garden. Whilst enjoying the indirect sunlight, we prevaricated about ordering food as we were not super hungry. And then we saw the chips and that settled it! After eating, we realised the football was underway and considered going to the other pub to watch it. I nipped in to check the score and noted their TV was smaller than the one at home. Opting for the Corpse Road back, we initially had trouble finding the entrance. 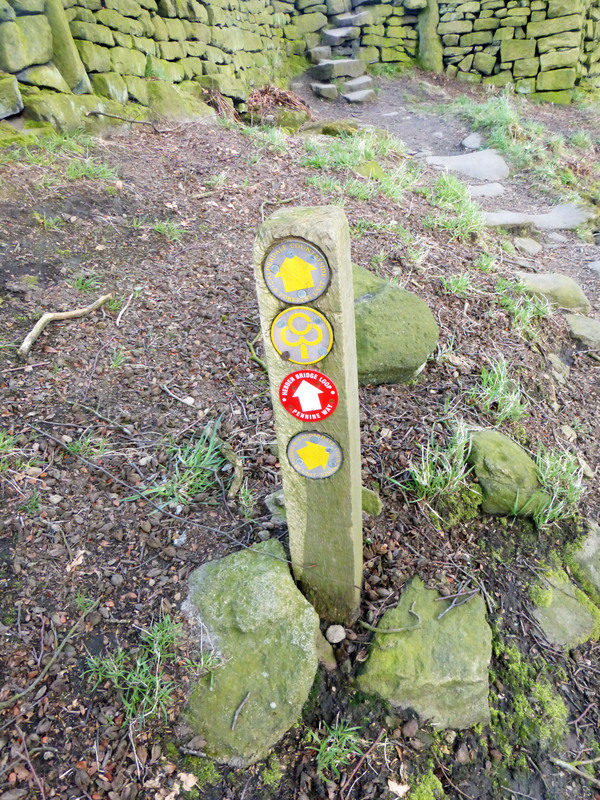 On finding it a little way down the road, a footpath sign indicated two different routes. We mistakenly took the upward path and arrived at the edge of Southfield. Returning to the sign, the other path started out as gravel path as it led past houses. It then became narrow and overgrown. We were repeatedly stung by nettles and brambles snagged at our clothes. The vegetation thinned alongside a low stone wall. Just after a rickety shed, we were led downwards. I remembered continuing in a straight line last time a rope barred our way. Forced to turn left and then right onto Heptonstall Road, the final stretch home was very quick. As I settled down with a coffee to watch the end of the football match, I felt boiling hot and had in urgent need of a cold shower. This entry was posted in heritage, landscape, photography, walking and tagged beer, bracken, brambles, branches, Calder Valley, Calderdale, chips, coffee, Corpse Road, Eaves Wood, England, ferns, food, football World Cup 2018, footpath, Green Lane, Hebden Bridge, Hebden Bridge Loop, Hell Hole Rocks, Heptonstall, Heptonstall Road, heritage, June, nettles, Pennine Way, quarry, ridge, shadows, Slater Ings, Southfield, steps, stones, summer, sun, The Cross Inn, The White Lion, Victorian, views, walking, wall, Yorkshire on July 3, 2018 by Hepdene Rose. We never tire of walking in Colden Clough. Due to the seasonal changes, it is impossible to have the same experience twice. 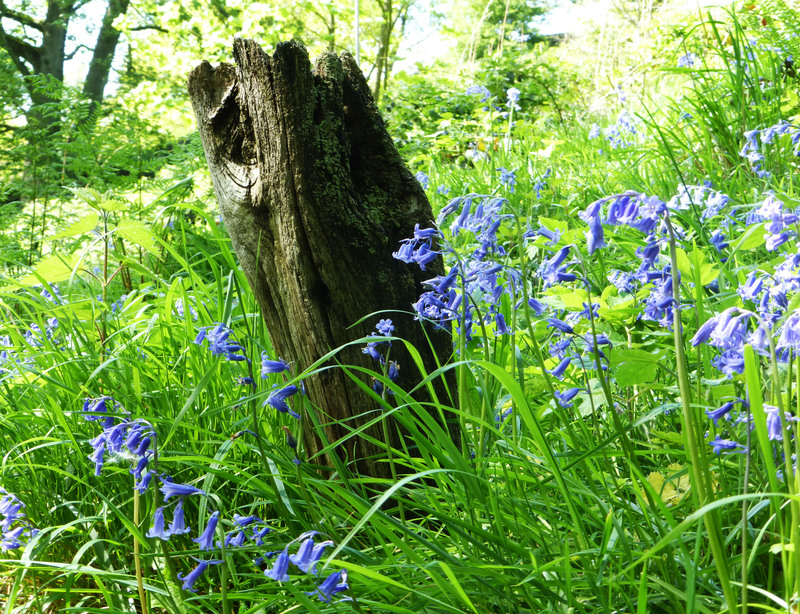 Spring walks are rewarded by a riot of bluebells and garlic, which we can smell before we see it (we pick young leaves away from the path for ace soups and pesto). 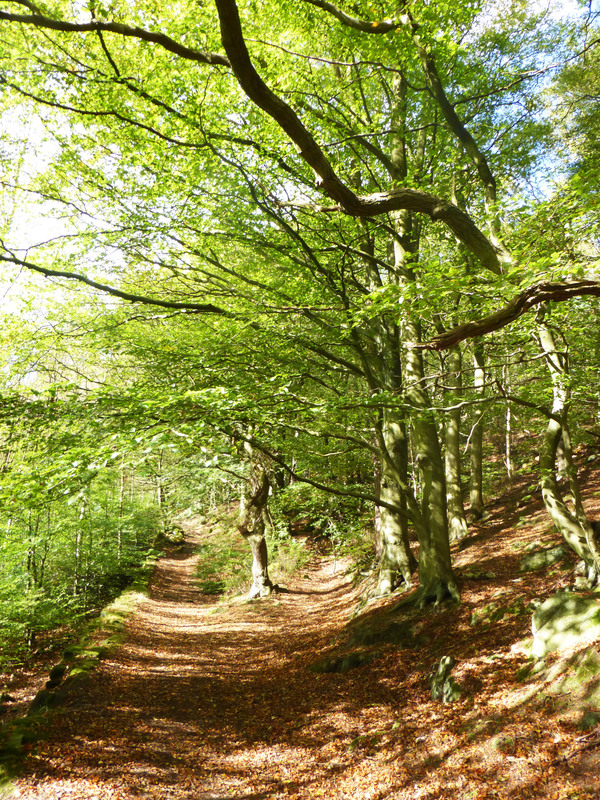 Summer brings the trees out in full bloom – beech and birch, oak and rowan are the most common. This is also usually (but not always!) the time when the lower paths are driest allowing navigation of routes otherwise too muddy and wet. Autumn brings out the true majesty of the trees in their golds, oranges, reds and browns. We may forage for beech nuts if the squirrels haven’t beaten us to it! And in winter, the Clough becomes a wonderland, when blanketed with snow or hoar frost. Despite the interest of organisations such as the AA i and the BBC ii, it is not unusual if you choose the less-trodden paths, to barely see another soul all day. Start by walking west out of town along the main road to the Fox and Goose pub. Then either turn right up the next path you come to or up Church Lane passed the parish church and keep going up. From here, there are numerous paths to choose, some of which take you very quickly to Lumb Bank. Others will lead you on a series of adventures via woods, rocky outcrops, up and down steps, and numerous examples of industrial archaeology. These latter two are Victorian creations: many of the small paths were built as a part of a job creation scheme in the early 1900’s. If you keep to the route of the river, you will eventually come to Hebble Bridge. In good weather, the river and clearing on the other side is busy with people picnicking, children paddling and dogs optimistically waiting for someone to play with them. Many of these may be staying at the campsite, just a little further up in the New Delight pub (known affectionately by locals as ‘The Newdy’). This can be reached by climbing either of the steep sets of steps in front of you as you come over the bridge. Turn right at the top and go along the lane. You then have choices to make: follow the packhorse trailii or the modern road to Heptonstall, go back into the Clough and keep heading down, or just get the bus back to town. 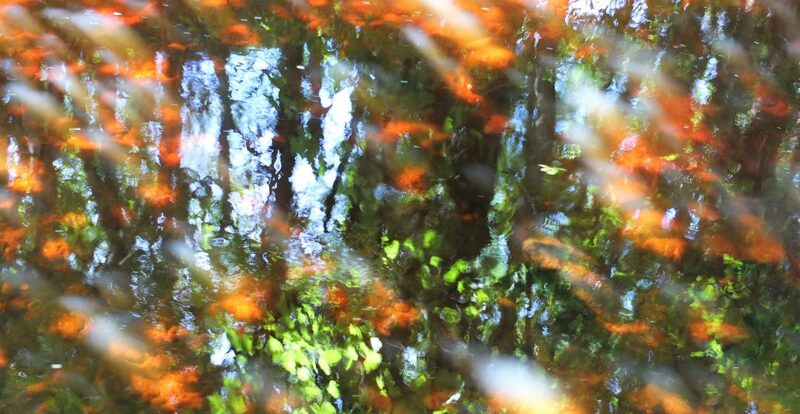 This entry was posted in archaelogy, landscape, photography, walking, woods and tagged archaeology, beech, birch, bridge, clough, Colden Valley, Hebble, Hebden Bridge, mill, oak, path, river, rocks, rowan, seasons, trees, Victorian, walking, woods on October 24, 2014 by Hepdene Rose.